Asheville doesn’t suffer from a lack of artistic outlets, but some local performers and supporters of the arts are seeking a major upgrade on one front. They want the city to host a performance venue with all the modern accoutrements—one that advances Asheville’s reputation as a community-minded arts mecca. 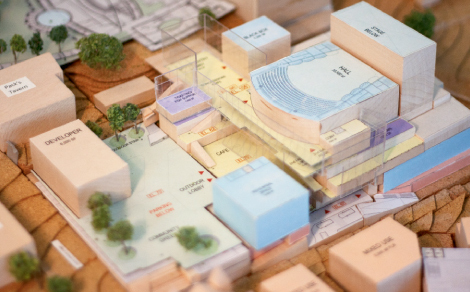 That’s the plan for the Performance Center in Asheville, a project launched in 2004 by Asheville Symphony board members. The symphony plays most of its shows at Thomas Wolfe Auditorium, a venerable facility that comes up lacking for certain types of entertainment. “Thomas Wolfe is good for many things, but it’s not a full-service performance facility,” notes James Baudoin, the project’s executive director. For example, the auditorium’s out-of-date infrastructure doesn’t allow for Broadway shows. The Performance Center, Baudoin says, will bring Broadway and much more to town. The centerpiece of the facility, which is slated to break ground in late 2013 and open two years later, will be a 2,000-seat, state-of-the-art concert hall. It will also include a multipurpose rehearsal, recording, and event space, a black box theater, digital media arts center, classrooms, and a plaza that will host performances. If things go according to plan, the Performance Center will be located on a 2.4-acre tract of city property directly south of City Hall. So far, the project has raised about $4 million dollars from donors, and an upcoming capital campaign aims to raise $30 million more. In addition, Baudoin is seeking a $10 million to $20 million sponsor for naming rights of the main concert hall. The fund-raising challenge is formidable, but he makes the case that the center would pay big dividends for Asheville, bringing an estimated $25 million to the local economy each year.